Verbal communication includes any mode of communication containing words, spoken, written or signed. People communicate verbally through the vocalization of a system of sounds that has been formalized into a language. Our capability to communicate with a language that is supported by an organized system of words, rather than merely sounds, is what sets us apart from lower species. It indicates the sending of information and receiving of information. Clarification is a key component of verbal communication. Effective communication does not only requires the transmission of information but also clarification of points made, expansion of ideas and concepts, and exploration of factors that fall out of the original thoughts transmitted. A variety of challenges may arise when using verbal communication to express oneself. Misunderstandings can arise because of impaired communication. The responsibility for the nurse, whether encountering the patient in the hospital or in the community, becomes recognizing when communication has become ineffective and then using strategies to improve transmission of information. Patient expresses thoughts and feelings in a coherent, logical, goal-directed manner. Patient demonstrates reality-based thought processes in verbal communication. Patient spends time with one or two other people in structured activity neutral topics. Patient spends two to three 5-minute sessions with nurse sharing observations in the environment within 3 days. Patient communicates in a manner that can be understood by others with the help of medication and attentive listening by the time of discharge. Patient learns one or two diversionary tactics that work for him/her to decrease anxiety, hence improving the ability to think clearly and speak more logically. Patient uses a form of communication to get needs met and to relate effectively with people and his or her environment. Ascertain circumstances or situations that may limit the patient’s ability to use or comprehend language, such as the following: Several clinical conditions may change the person’s ability to communicate effectively. Sounds are not produced when air does not pass over the vocal cords. Words are articulated by coordinated movements of mouth and tongue; when movement is impinged, communication may be ineffective. Review history for neurological conditions that could affect speech, such as CVA, tumor, multiple sclerosis, hearing loss, and so forth. This is necessary to assess causative/contributing factors. Evaluate mental status, note presence of psychotic conditions (e.g., manic-depressive, schizoid/affective behavior). Assess psychological response to communication impairment, willingness to find alternate means of communication. Evaluating the mental status of the patient is vital to determine contributing factors. Patients may speak a language properly without being able to read it effectively. Discharge self-care and follow-up information must be communicated and strengthened with written information that the patient can use. In recognition of the wide array of cultures and physical challenges that patients face, it is the nurse’s responsibility to communicate effectively. Patients may have skills with many forms of communication, yet they will favor one method for important communication. It is necessary for the health care team to learn that the construct of gestured language has a completely different structure from verbal and written English. A way to be certain if communication has been productive is to provide for a certified interpreter to confirm information from both sides of the discussion. Assess environmental factors (e.g., room noise level). The surrounding may affect the ability to communicate. Evaluate the patient’s energy level. Fatigue/shortness of breath can make communication difficult or impossible. Observe for the presence and history of dyspnea. Patients who are experiencing breathing problems may reduce or cease verbal communication that may complicate their respiratory efforts. Learn patient needs and pay attention to nonverbal cues. The nurse should set aside enough time to attend to all of the details of patient care. Care measures may take longer to complete in the presence of a communication deficit. Place important objects within reach. To maximize patient’s sense of independence. Provide an alternative means of communication for times when interpreters are not available (e.g., a phone contact who can interpret the patient’s needs). An alternative means of communication (e.g., flash cards, symbol boards, electronic messaging) can help the patient express ideas and communicate needs. Never talk in front of patient as though he or she comprehends nothing. This increases the patient’s sense of frustration and feelings of helplessness. Clarify your understanding of the patient’s communication with the patient or an interpreter. Feedback promotes effective communication. Keep distractions such as television and radio at a minimum when talking to patient. To keep patient focused, decrease stimuli going to the brain for interpretation, and enhance the nurse’s ability to listen. Avoid talking with others in front of the patient as though he or she comprehends nothing. Excluding the patient from an interaction increases the patient’s sense of frustration and feeling of helplessness. Do not speak loudly unless patient is hearing-impaired. Loud talking does not improve the patient’s ability to understand if the barriers are primary language, aphasia, or a sensory deficit. Maintain eye contact with patient when speaking. Stand close, within patient’s line of vision (generally midline). Patients may have defect in field of vision or they may need to see the nurses’ face or lips to enhance their understanding of what is being communicated. Individualize techniques using breathing for relaxation of the vocal cords, rote tasks (such as counting), and singing or melodic intonation. To assist aphasic clients in relearning speech. Give the patient ample time to respond. It may be difficult for patients to respond under pressure; they may need extra time to organize responses, find the correct word, or make necessary language translations. Maintain a calm, unhurried manner. Provide sufficient time for patient to respond. Individuals with expressive aphasia may talk more easily when they are rested and relaxed and when they are talking to one person at a time. Praise patient’s accomplishments. Acknowledge his or her frustrations. The inability to communicate enhances a patient’s sense of isolation and may promote a sense of helplessness. Provide environmental stimuli as needed. To maintain contact with reality; or reduce stimuli to lessen anxiety that may worsen problem. 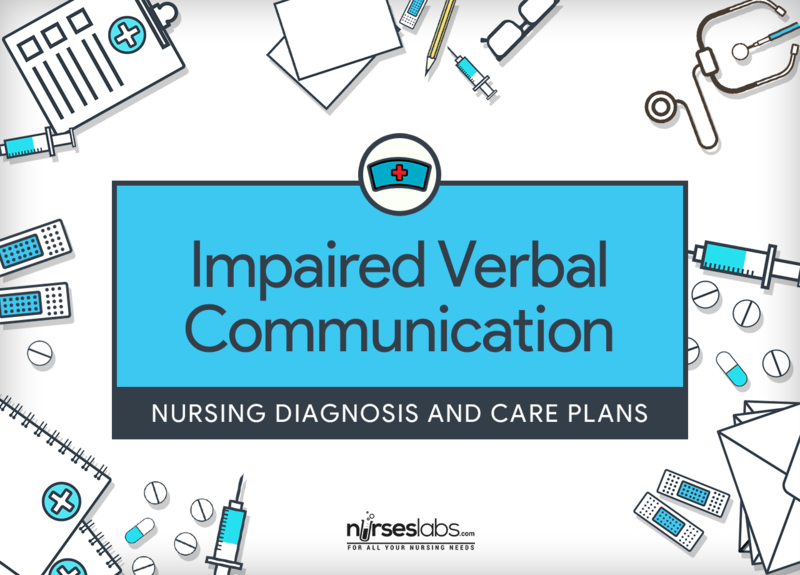 Use confrontation skills, when appropriate, within an established nurse-patient relationship To clarify discrepancies between verbal and nonverbal cues. Try to phrase questions requiring a “yes” and “no” answers. Patients can be frustrated when they cannot communicate in a simple manner. Use short sentences, and ask only one question at a time. This method allows the patient to stay focused on one thought. Speak slowly. This approach provides the patient with more channels through which information can be communicated. Provide concrete directions that the patient is physically capable of doing (e.g., “point to the pain,” “open your mouth,” “turn your head”). Simple, one-action directions enhance comprehension for the patient with language impairment. Provide practice sessions within the day. Practice will increase the patient’s communication. Correct errors. Not correcting errors reinforces undesirable performance and makes correction more difficult later. Create a list of words that the patient can say; add new words to it as needed. Share this with family members, significant others, and other care providers. Sharing information with others broadens the group of people with whom the patient can communicate. Provide word-and-phrase cards, writing pad and pencil, or picture board. Use eye blinks or finger movements for “yes” or “no” responses. Supplemental communication devices are especially helpful for intubated and tracheal patients or those whose jaws are wired. Use and assist patient or significant others to learn therapeutic communication skills of acknowledgment, active-listening, and Imessages. Improves general communication skills. Involve family and significant others in plan of care as much as possible. Enhances participation and commitment to plan. Carry on a one-way conversation with a totally dysphasic patient. It may not be possible to determine what information is understood by the patient, but it should not be assumed that the patient understands nothing about his or her environment. Consider the use of an electronic speech generator in post-laryngectomy patients. Adaptive devices can aid communication with patients who cannot produce vocal speech. Assist the patient in seeking an evaluation of his or her home and work settings. This evaluation will help the patient make decisions about the need for assistive devices such as talking computers, telephone typing devices, and interpreters. Allow significant others the opportunity to ask questions about the patient’s communication problem. It is vital for the family to know that there are many ways to send information to someone and that time may be needed to understand the special needs of the patient. Refer to appropriate resources (e.g., speech therapist, group therapy, individual/family and/or psychiatric counseling). Specialized services may be required to meet needs. Refer to NDs ineffective Coping; disabled family Coping (as indicated); Anxiety; Fear. To promote wellness.